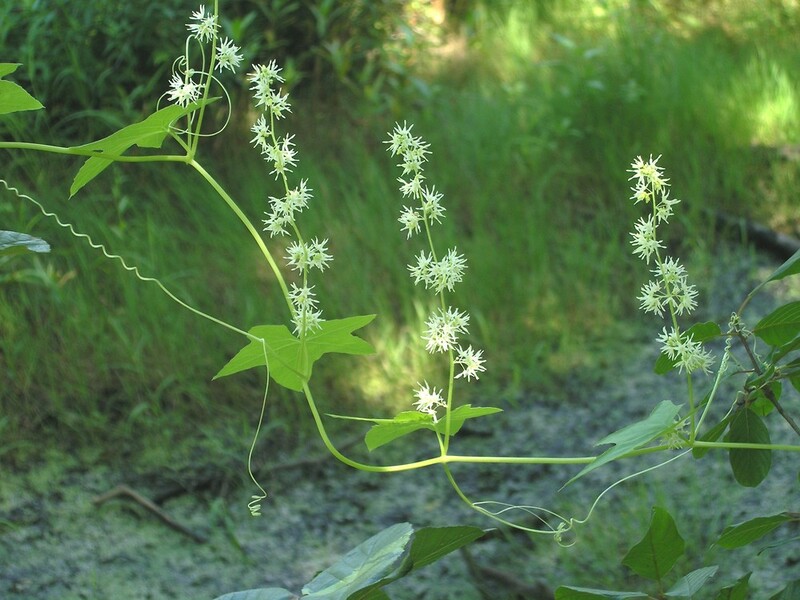 Echinocystis lobata plant in bloom. By Bruce Patterson. Copyright © 2018 Bruce Patterson. New England Wild Flower Society. gobotany.newenglandwild.org (Accessed 4/2018). Echinocystis lobata seedling. 2013 © Peter M. Dziuk. Minnesota Wildflowers. minnesotawildflowers.info (Accessed 4/2018). 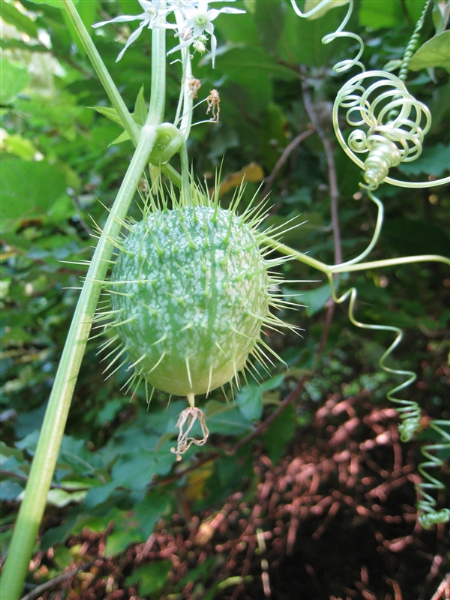 Echinocystis lobata is an annual vine with 3-forked, tightly coiled tendrils, stems usually not hairy (Uva et al. 1997). 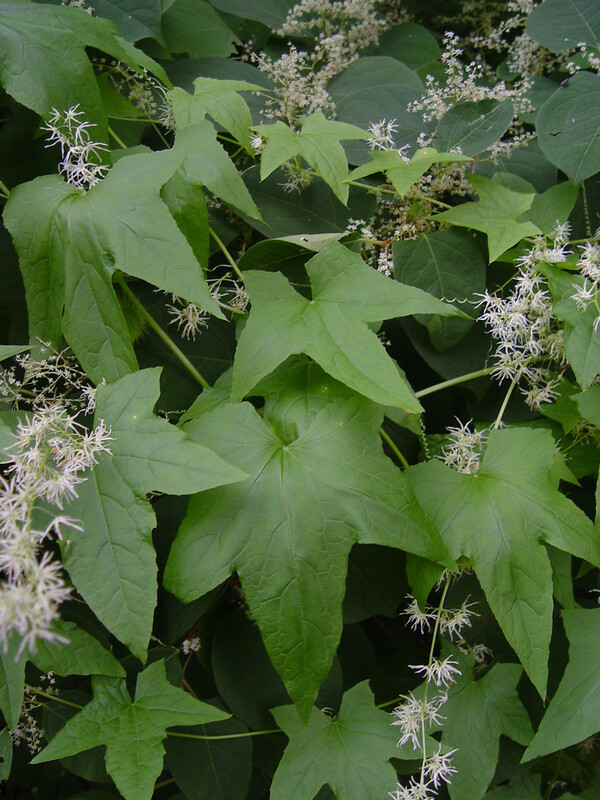 Echinocystis lobata leaves. By Donald Cameron. Copyright © 2018 Donald Cameron. New England Wild Flower Society. gobotany.newenglandwild.org (Accessed 4/2018). 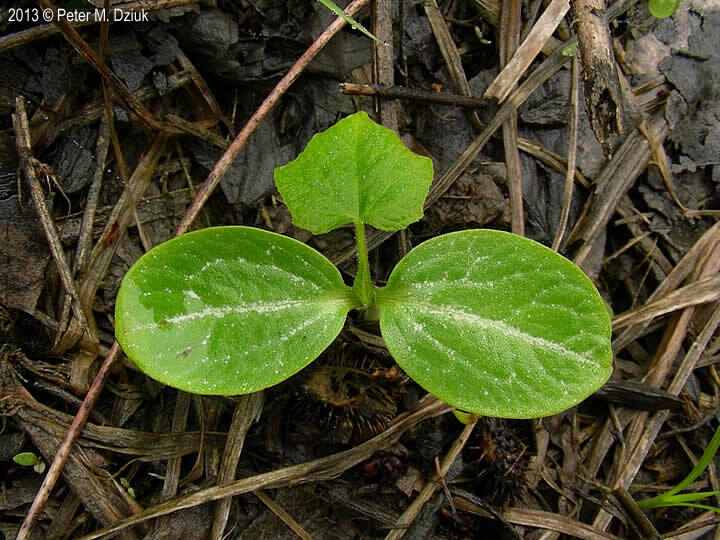 Leaves alternate, deeply 5-lobed, lobes, triangular lobes, tips sharply pointed, veins palmate, hairy on upper surface, typical of squash-family leaves; seedling leaves large, fleshy, oval conspicuous on bare soil of floodplain woodlands. 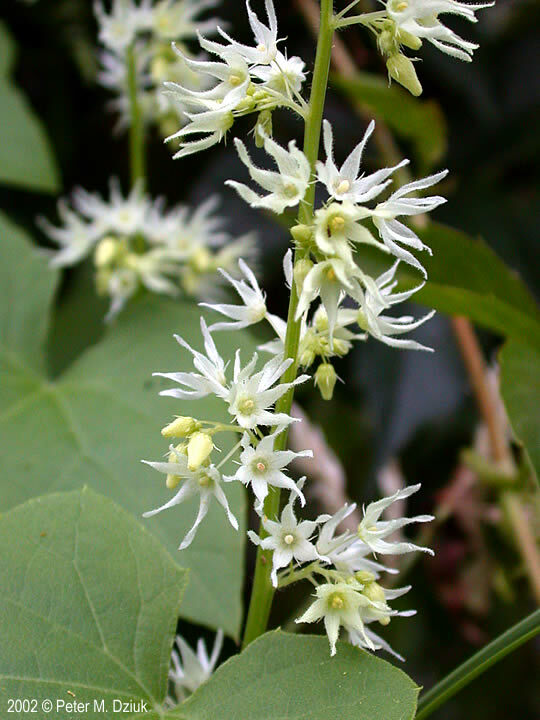 Echinocystis lobata male flowers. 2002 © Peter M. Dziuk. Minnesota Wildflowers. minnesotawildflowers.info (Accessed 4/2018). Echinocystis lobata female flower. ex W. H. Wagner slide collection. Herbarium University of Michigan. michiganflora.net (Accessed 4/2018). Flowers small, white, 6-parted, radially symmetrical, sexes separate on same plant (monoecious), male flowers 0.8-1 cm wide, petal lobes 6, long-pointed, in branched, axillary clusters about 35 cm long, fairly conspicuous and showy collectively; female flowers one or few, in same axils; blooming and fruiting June-Sept.
Fruit becoming dry, oval, 3-5 cm, gourd-like, covered with short, weak spines, fleshy at first then drying to papery, wrinkled texture outside, inner flesh drying to a white fibrous network (Levine 1995), 2-chambered; 4 dark seeds, flattened, about 1.5 cm long. Echinocystis lobata fruit. B. S. Walters. Herbarium University of Michigan. michiganflora.net (Accessed 4/2018). Habitat: Moist open areas, edges, borders, fences, climbing on other vegetation. 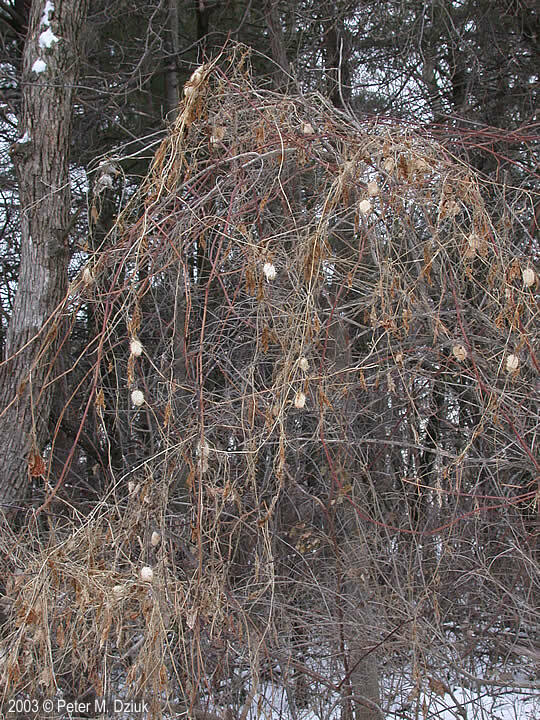 Echinocystis lobata winter plant. 2003 © Peter M. Dziuk. Minnesota Wildflowers. minnesotawildflowers.info (Accessed 4/2018). 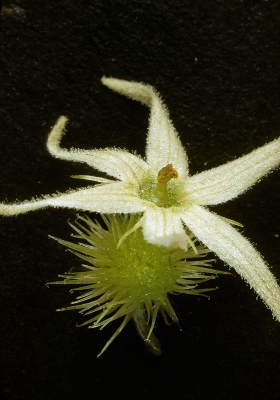 Notes: Usually less common than Sicyos angulata, our other native member of the Cucurbitaceae (Uva et al 1997).